Bessie and Tranquility are ready to roll! Yesterday we launched! The last week has been intense and exhausting as we finalized downsizing for now, moved what we’re keeping to our 10′ x 10′ climate-controlled storage, loaded the truck and trailer, and cleaned the rental home in order to pass along the keys to our wonderful landlord. We underestimated the time for the above, thus left Denver at 1pm MDST with our truck, Bessie, and trailer, Tranquility. Last month we made campground reservations for the first few days, knowing that we wanted to stay put for several days to catch our breath. Just after midnight we seemed to fall into bed as solid as weights! We fell asleep to the pitter-patter of rain with windows open for a breeze. We slept in this morning. Enjoyed our French press coffee and oatmeal. Walked the campground. Read and napped. 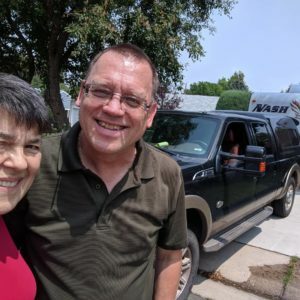 And… left the campground to seek out cell service in a small Kansas town in order to contact our children. We are taking the opportunity to share this post and also make posts to Facebook and Instagram. We will create posts as we travel based on cell service or free Wi-Fi at public libraries, coffee shops, or restaurants that offer it. Our Hotspot service was used too much this month, so we’ll be “throttled” to a slower speed for our Wi-Fi portion of the plan. Traveling full-time at “Life at the Speed of Sanity”! Be safe!! Storms seem to be all over. I was concerned about you yesterday but you must have been south of what Colorado got. No fun trying to set up the trailer in the dark. Hope the trailer is safe right now. Love you!! Thank you, Mom. It’s now Day #24. I’m grateful for Wi-Fi access so I can view and respond to your message. Thank you, Carol. I hope that you and Paul are getting situated in your new abode. We’ll let you know when we’re in the area. Sounds wonderful, especially sleeping in and waking to rain! Enjoy your travels! Janis Camerlinck, Kansas City KS. Welborn Church member where we loved your great grandfather’s paintings so much! Hello Janis. Thank you for your kind message. How I appreciate Welborn Church and the wonderful history. I was deeply touched by my 2012 visit where I saw his paintings in person. I will treasure the history book that was thoughtfully put together and printed. My copy arrived a couple of weeks before we launched. I’ve enjoyed reading it. Blessings to you and Welborn. Nothing like starting out with a very l-o-n-g day! Perhaps we’ll see you in Batavia in August. Hello Maureen. Unfortunately we didn’t get to visit Batavia but a few hours on our visit this year. Hopefully next time we can plan for a longer visit. Please stay in touch. Hugs to you. I am excited for you both! 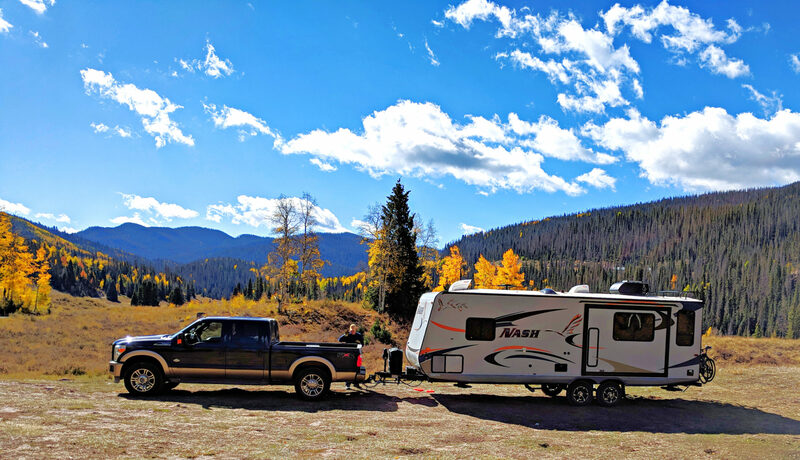 I look forward to hearing about your adventures and how you like being full time rv travelers! Happy travels! Hello my dear cousin! Thank you. I can’t wait to meet up with you and Tom at some point during our travels so we can all camp together. Thank you for all of your encouragement. Love you. You finally did it. Enjoy your new life. Thanks my dear friend! And, we are enjoying our first trip with a special time with you, Gene, and your Wisconsin family. Thank you for everything. Love and hugs. Thank you der cousin, Jenny! We look forward to seeing you and Ron when we get to Texas sometime over the winter. Love and hugs. Enjoy all that you are about to encounter. Big hugs. Thank you, Carol. It will be fascinating to see what we encounter. Hugs back to you. . . . . . . And they’re off! Blessings as you begin this long sought after adventurous life style. Your investment in “wheel estate” is evident by the pictures. Relax for the next few days and begin to enjoy God’s world in a new and refreshing way. Safe travels! Thank you, Lois. What a cute statement about “wheel estate”. We’ll keep that one in mind. We sure enjoyed our visit with you and the neighbors. Thank you for your hospitality. Love and blessings. Way to go! Can’t wait to read about your adventures and see the pics! Thank you Barbara and Kevin. 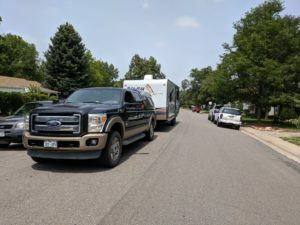 It was such fun to get acquainted with you folks in May and to learn of your year of RVing. We’ll let you know when we’re in your neck of the woods. Our best to you. Previous PostPrevious Countdown to Launching! Next PostNext The Pace of All Paces!